We still have a few copies of Night Scenes 2016 remaining. 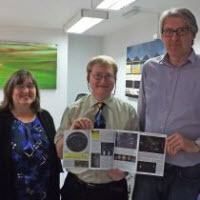 The new expanded colour edition compiled by Paul Money, is really quite indispensable, packed full of information on the coming astronomical year. Priced at £4.50 for members (£6.50 for non members) they are a bargain for any level of sky watcher. In this month's In-Focus article, Mark Dawson takes a tour of the "Heavenly G", which links bright stars in the southern winter sky. Stellar evolution is regarded as one of the fundamental processes involved in the building of the universe we see around us today. Just as someone who studies the variety and growth of trees in a forest to fathom its evolutionary cycle, so astronomers study the forest of stars in the night sky to understand stellar cycles and the implication these have on the wider universe. We have been invited to assist at the forthcoming ‘star night’ at Eskdale school on March 4th (the night after our March meeting). 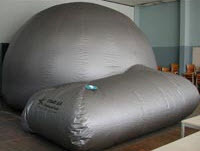 The event, which will be similar to the one held 2 yrs ago at Eskdale, where I recall we tried in vain to spot comet Pannstars, will have the cosmodrome planetarium sited in the main hall. If skies are clear our scopes will be erected outside the back of the school, hopefully observing Jupiter, Orion etc.